Hello, my name is Michael. I've owned BMW's for many years and was looking for something that was still fun to drive but was more reliable. 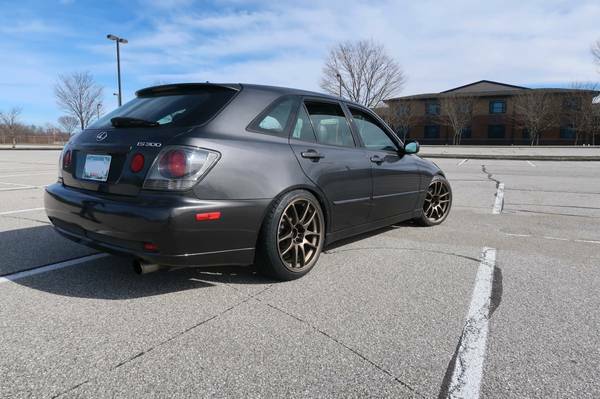 I recently purchased a 2002 IS300 Sportcross that the previous owner swapped a manual transmission into. I'm joining this community to learn more about these cars and find parts to purchase. Thanks! Welcome to the forum. Show us some pictures of your manual swapped SC. Welcome along, hopefully the IS proves to be more reliable and fun and cheaper to mod/maintain. Here's one pic from the for sale ad. When I bought it, it was slammed pretty low to the ground on BC Racing coilovers. I raised it up about an inch and put some Pilot Sport 4S tires on it over the weekend. It seems kind of floaty over bumps. I'm going to try playing with the knobs on the coilovers. I love the torque of the 2J! My next goal is to try and find an L Tuned or HKS TI Limited exhaust for it.